Definitely, definitely a keeper! Thanks Six Sisters’ Stuff! We eat a lot of chicken. It’s a meat most of the five of us enjoy, most of the time. I’m being very diplomatic in that statement, because not everyone likes all of it all the time. That said, I’m constantly on the lookout for some variety in our chicken recipes. We do breaded chicken, we do chicken with mushrooms, we bake it, we saute it, but I’m just always searching. Recently I found a great one. It looked delicious and it did not disappoint. Almost all five of us loved it. This recipe is from the blog Six Sisters’ Stuff, and I’m pretty sure I’ve made some of their other “Stuff” before, and shared it here. When I made this recipe, I knew for sure I had to share it here. It was amazing! 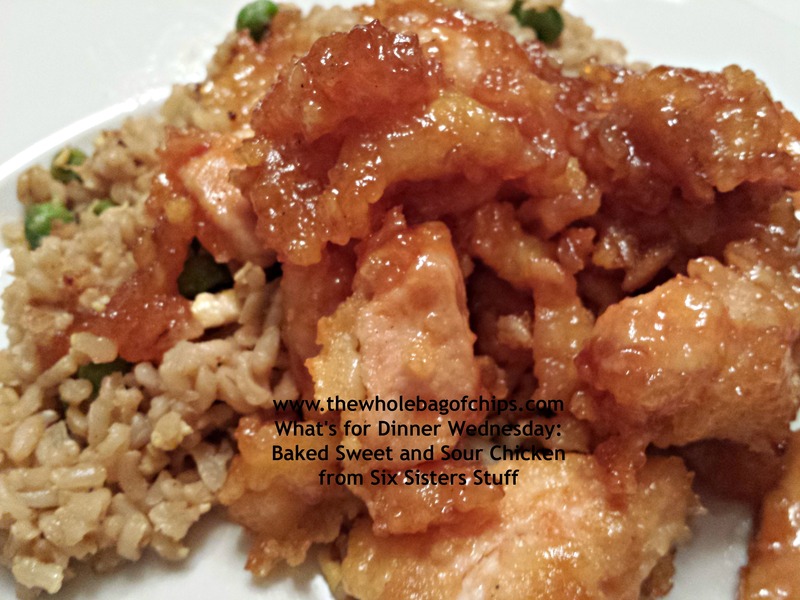 The recipe is for baked sweet and sour chicken and in the description they said it was just like Chinese take out. I served it with a side of my Light Vegetable Fried Rice, to which I now always add a dash of sesame oil, and it was a perfect combination. You’ll definitely want to give this recipe a try, and soon! It’s easy, there’s not a ton of ingredients, and it’s delicious. Here’s the recipe exactly as it appears on Six Sisters’ Stuff, I did not change a thing, other than using chicken tenderloins instead of breasts. Preheat oven to 325 degrees. Cut chicken breasts into bite-sized pieces and season with salt and pepper. Place cornstarch and beaten eggs in separate bowls. Dip chicken into cornstarch then coat in egg mixture. Heat canola oil in a large skillet over medium-high heat and cook chicken until browned. Place the chicken in a 9 x 13 greased baking dish. In a medium sized mixing bowl, whisk together sugar, ketchup, vinegars, soy sauce and garlic salt. Pour over chicken and bake for one hour. ← Stop by and visit us on….